Plant It Wild invites you to a program on forest management to improve wildlife habitat July 24, 7 pm at Trinity Lutheran Church, Frankfort. Eric Ellis, of the Conservation Resource Alliance, will be speaking on private sustainable forest management, planting native flora, invasive species removal, improving wildlife habitat, and maintaining the ecological integrity of riparian corridors. Given the destruction of our trees from invasive insects and other diseases, property owners will want and need to understand how to manage a succession forest. The Conservation Resource Alliance works to maintain and restore regional riparian and wildlife corridors. Efforts include road/stream crossing repair, invasive species control, native tree and shrub plantings, stream bank stabilization, fish habitat improvements, and sustainable forestry implementation. Recent projects have focused on restoring early successional forests to improve wildlife habitat, especially for migratory bird species. This presentation will provide an overview of early successional restoration techniques as practiced in northern Michigan and will review the forest types, native plant species, and wildlife that benefit most from this work. Numerous examples from on-the-ground projects will be presented. Eric Ellis is a wildlife habitat biologist and native Michigander who received his BS in resource ecology and management from the University of Michigan. He later worked in the Peace Corps in parks/wildlife. He completed an MS degree at the University of Idaho College of Natural Resources. Eric now works in Traverse City, managing the Conservation Resource Alliance’s Wild Link program. Admission to the program is free and open to the public. There will be a social time following the meeting. Plant It Wild is a Michigan native plant organization whose mission is to foster greater awareness and appreciation of the fragile natural environment of our region. Through direct efforts, we work to preserve, protect, and promote the natural beauty of the area and its plant communities. For information contact Phyllis at 231-392-1206 or Carolyn at 352-6962. 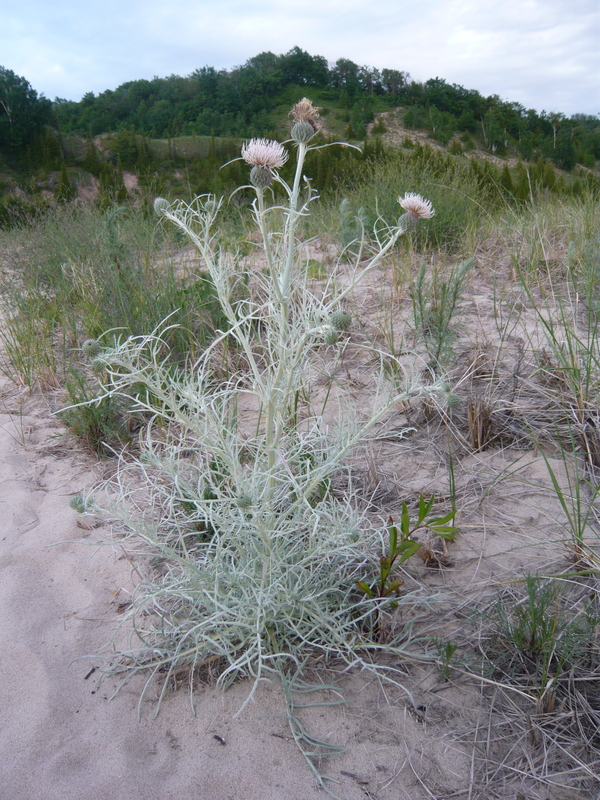 A pitcher’s thistle, just one of many rare plant and animal species we can learn to protect in our area.